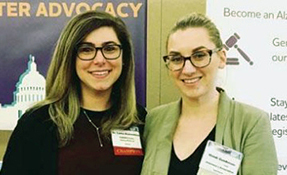 Congratulations to Lama Alameddine, PsyD, a 2014 graduate of the Wright Institute Clinical Psychology Program, for receiving the Alzheimer's Association 2018 Community Partner of the Year Award! The Washington State Chapter of the Alzheimer's Association presented Alameddine with the award on March 8, 2019, in recognition of her work assisting dementia patients and their families. As a clinical neuropsychologist with the University of Washington's Valley Medical Center, Alameddine developed a Neuroscience Institute multidisciplinary program called Cognitive Health and Memory Patient Clinic (CHAMP). CHAMP helps dementia patients and their families in a variety of ways, including enrolling patients in grant-funded programs through the Alzheimer's Association that help them get in-home care, access to respite care, meals, and transportation. CHAMP is the first clinic of its kind in Washington state. Learn more about the Wright Institute's Master of Counseling Psychology program. Learn more about the Wright Institute's Doctor of Clinical Psychology (Psy.D.) program.